Clever, energetic, independent, and sensitive, the Curly Coated Retriever is eager to learn and excel. 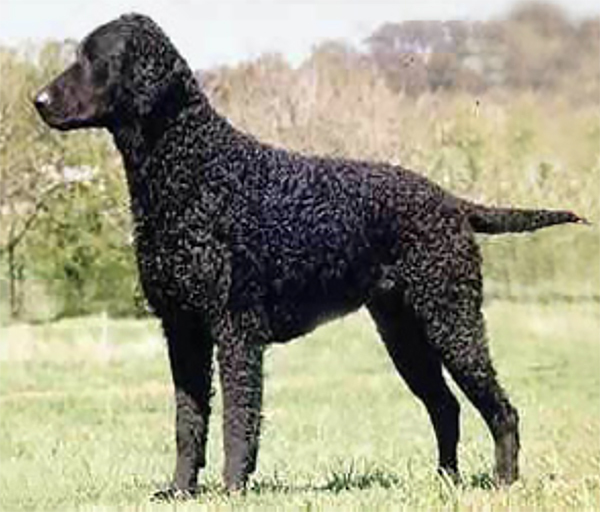 Originating in England, the Curly Coated Retriever is considered one of the oldest retriever breeds, emerging from the 16th century through the now extinct English Water Spaniel, the Retrieving Setter, and possibly the Irish Water Spaniel. This breed was originally bred for upland bird and waterfowl hunting, and was first exhibited in his current form in 1860. The Curly Coated Retriever is a bit more leggy in appearance than other retrievers and is known for grace and agility in motion. He is alert, intelligent, and active. He is a great field dog with stamina and courage. More reserved with strangers than the other retrievers, he is loyal, good with children, and a quiet house dog when well-exercised. He responds well to training and an owner who is willing to be the leader. An active owner committed to exercising and training the dog, and who will take a leadership role. Inexperienced dog owners who cannot be the leader. Small children if the dog is too active. These are intelligent, energetic companions who are trainable, affectionate, and get along well with people and other pets. Can be willful and stubborn at times, possibly frustrating the novice dog owner. Females: Preferred height at the withers is 23-25 inches. Males: Preferred height at the withers is 25-27 inches. There is no weight specified in the standard but dogs range from 60 to 95 pounds. The only permissible colors are sold black and solid liver. Some dogs have a little white star on the chest but it is not preferred. Moderately high to high. A well exercised Curly makes a quiet house companion, but to achieve this, he will require daily longs walks, preferably with retrieving and swimming. Usually they are excellent with children but they need to be properly socialized to them. The more exuberant Curlies may not be suitable for toddlers. Typically gets along well with other animals but, again, proper socialization will ensure success. These are active dogs who excel at hunting, obedience, fly-ball, and agility. The Curly is defined by his tight, crisp curls found all over his body except the face and the front of his legs. He requires very little grooming other than trimming the scraggly hairs from his tail and the back of his legs to give him a more polished look. Brushing him will ruin his curls so after a bath or swim, simply pat him dry and his curls will tighten up. His shedding is low. Problems seen in Curlies are hip dysplasia, epilepsy, eye problems, and an unusual condition called Glycogen Storage Disease which is an enzyme deficiency that can lead to liver failure.